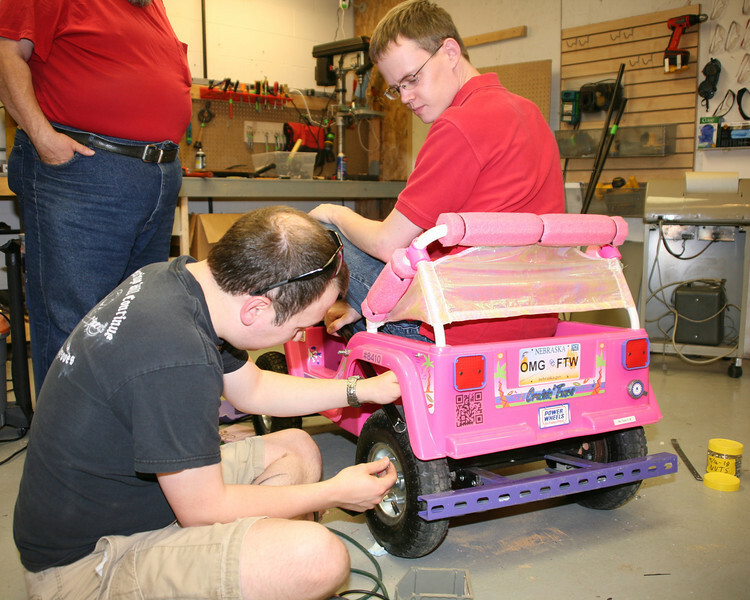 Omaha Maker Group, with no experience and only about 2 months of time, decided to build an entry for the Power Wheel Racing Series at the Kansas City Maker Faire. When the #8410 Barbie burned up a speed controller with only days to go, part of the team jumped over to another Omaha team - The Lone Hacker - and helped him to a 2nd-place overall finish! Copyright statement All photographs under ejk00.smugmug.com are copyrighted, with all rights reserved. Use by copying or by reference/linking by permission only. Requests for permission may be made through e-mail. Provide contact information and indicate photograph(s) of interest. Kevin Fusselman installs a support spring on the hand brake while Ben Hutcheson ensures it won't interfere with driving.